Estadio Cornellà-El Prat is the home of top flight Spanish side RCD Espanyol and eighth stadium in the club’s history. The new stadium built in Catalonia, took around three years to construct with an approximate cost of €90 million and a final capacity of 40,500. Technically known as Estadi RCD Espanyol. the stadium is popularly referred to by fans as Cornella-El Estadio Prat or just Corneprat. An ambitious project by the club, Estadio El Prat has won several awards for its design and small ecological footprint such as the 2010 Stadium Business Award where it beat the likes of the prestigious Dallas Cowboys Stadium and the O2 Arena in London, formerly the millennium dome. 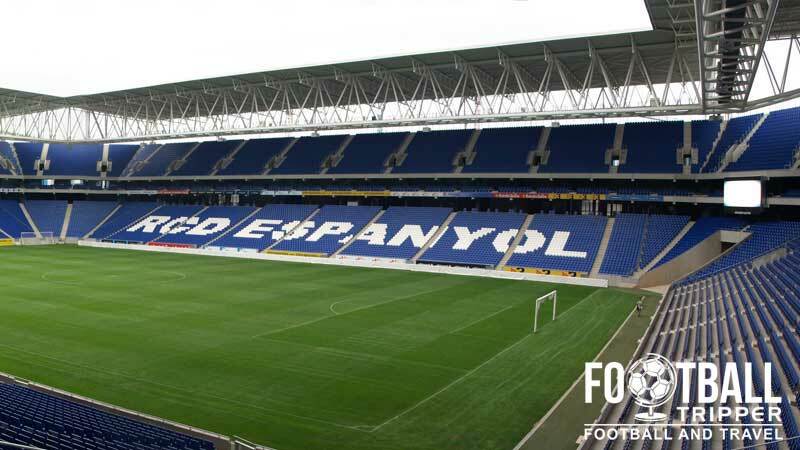 The construction of the new ground took over 6 years, with the land purchased back in 2002, and the inaugural match being held on August the 9th 2009 where Espanyol beat visitors Liverpool FC in a 3 nil shut out. The wait for fans of the club has definitely been worth it as far as they are concerned having received the highest distinction from UEFA who designated it as a category 4 stadium. With room for expansion, combined with other European stadiums becoming more environmentally concious themselves, Estadio Prat will certainly prove to be a continued source of pride for fans of the club, with the ground hosting an International friendly between Nigeria and Catalonia on January 2nd 2013. The ground is easily the most modern in the city of Barcelona, with the rival football team currently exploring the feasibility of renovating the iconic Camp Nou. El Prat consists of four stands: Gol Prat (North), Tribuna Presidencial (East), Gol Cornella (South) and Tribuna (West). 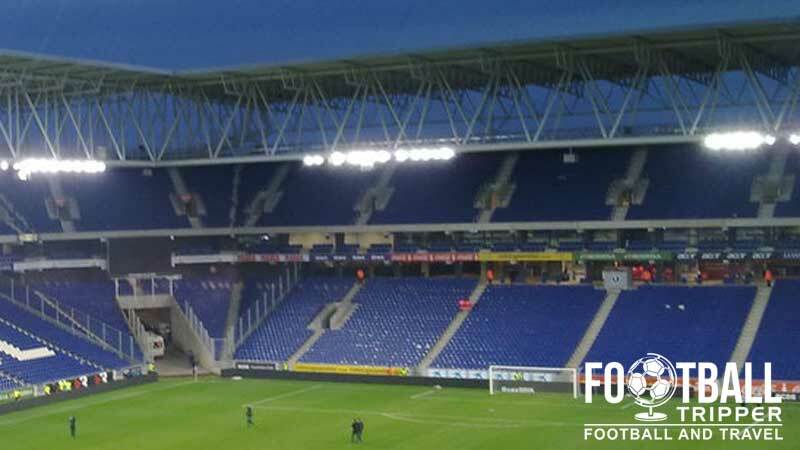 Away fans who make the trip to see their team take on Espanyol in their own backyard are usually confined to a small section of seating within the north-west corner. Highlighted on the above seating plan by the colour pink, the away section wraps around the access tunnel and is separated from the home supporters by a row of steel fencing either side of it. There isn’t an expansive range of eating and drinking options, with the nearby Cornella Shopping Centre offering a few places to drink before the match although not as much as within Barcelona city centre itself. The map below reveals the locations of some of the more popular pubs. Food wise you certainly won’t starve as there is a shopping centre attached to the stadium (Did anyone say Burger King?) as well as a handful of restaurants north of Parc de la Ribera such as El Brot de l’All i Oli and restaurante Casa Narvaez which both come served with decent online reviews. RCD Espanyol operate two club shops at the stadium, one within the city centre (Sports City Jarque) and an official online store known as Botiga RCDE Oficial. As the two located at Cornella El Prat are the most popular I’ll only list their opening times. The interior of the RCD Espanyol Store complete with panorama of the stadium, and carpet which mimics the pitch! RCD Espanyol are now opening the doors of Cornellà-El Prat to fans of the Periquitos (Parakeets) with the announcement of 60 minute tours of the new world class facilities.Tours cost €10.00 for adults, and €5.00 for everyone else. Not available on matchdays, tours are usually bookable Monday to Friday between 12.30 am to 4.30 pm, and on Saturdays between 11.00 am and 12.30 pm. To book your place on a tour email the club [email protected], phone 902.666.902 / 93.292.77.00 (Ext. 3018) or purchase tickets at the box office at the RCDE Stadium. 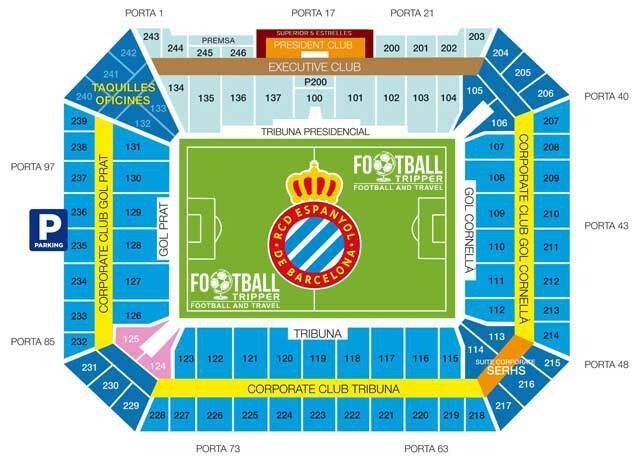 To see RCD Espanyol play at home you can buy tickets either online ([email protected]), by phone (+34 932 927 700) or at one of the numerous Taquillas (Ticket windows) at the stadium leading up to, and on the day of the football match. The blue and whites rarely sell out their home fixtures and you may be surprised to learn that even matches against Madrid and rivals Barcelona aren’t guaranteed to sell-out which thankfully works in our favour! 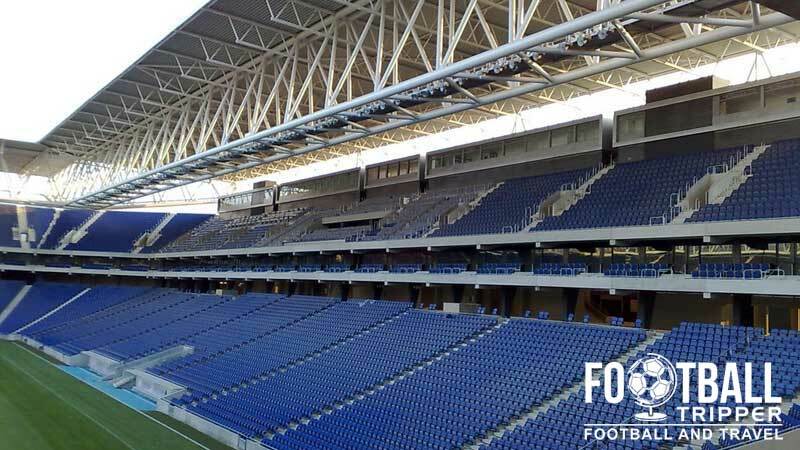 Ticket prices vary depending on who Espanyol are playing but with new facilities and a state of the art stadium, expect to pay a few euros more for the privilege. €30-35.00 for a seat either behind the goal or in the corner is a fair price range, and you’re looking at around €60-70.00 for a seat at the main stand close to the pitch. Cornellà-El Prat stadium is located on the Western side of the city, although arguably South-West is more of an accurate description as the coastline isn’t strictly South facing. The exterior of RCD Espanyol’s stadium, we need to change the cover image! At a distance of around 10km from the city centre it certainly isn’t walkable for the average fan. There are an estimated 3,278 official car park spaces at the ground. Major cities in Spain are blessed with decent transport infrastructure, and like Madrid, the metro is the easiest way of getting around in Barcelona. You will need to take Metro Line 5 and get off at the Cornellà Centre Station after an approximate journey of 25 minutes, resulting in a 15 minute walk to the football ground. Alternatively you can catch a FGC (Ferrocarrils de la Generalitat) commuter train service which uses the Llobregat-Anoia line. Departing from Plaza Espanya, make sure you get off at Cornellà Riera station which is simply a 5 minute walk away from the stadium. Station or public bathroom? Bit of both probably, smell wise. Another option albeit slower one is to catch the bus. Services 94 (Circular Cornella 2) and 95 (Circular 1 Cornella) stop right outside the stadium on Avenida del Baix Llobregat which is quite convenient. Barcelona boasts the second largest airport in Spain (Barcelona-El Prat), and fans of Espanyol will be relived to know that it is much closer to Estadi El Prat (9km) than it is to the Nou Camp (13km). Once you have landed there are numerous ground transport options for you to choose from depending on where your hotel is. 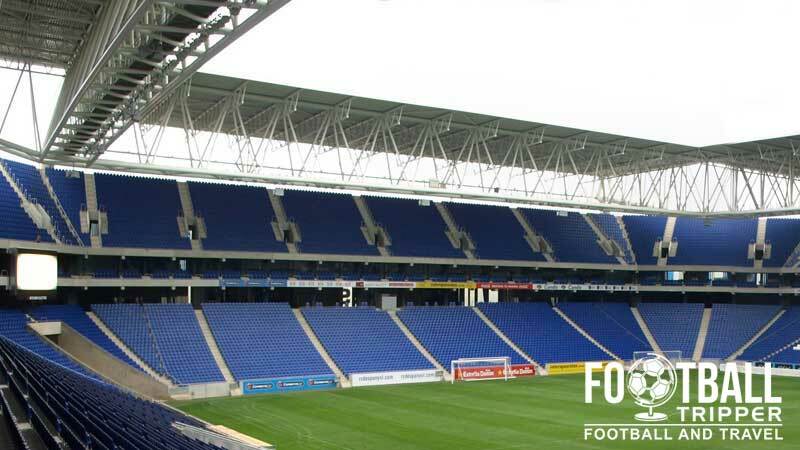 To go direct to Espanyol’s stadium you can catch a L77 bus service or if you need to get to the city centre then you can use the R2 Nord Commuter Train line to take you to Sants Railway station (city centre) and the TMB public bus line 46 which takes you to Plaça d’Espanya, again central. There are quite a few hotels near Cornella-El Prat such as Ibis Barcelona Cornella and Campanile Barcelona Sud Cornella, and they can almost be justified due to the 10.00 km or so distance from the city centre and proximity to the airport but ultimately as a tourist I suspect you’ll want something in the city centre. In which case there are too many to choose from so I recommend you do your own research on this one!